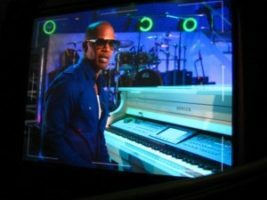 Backstage, on stage, in the pit, on the bus, in the audience, you name it Go To Team had Academy Award winner and Grammy nominee Jamie Foxx’s “Blame It” Tour covered for BET’s behind the scenes special. When Foxx’s bus rolled into the Greensboro Coliseum, GTT’s DP Tom Wells and Jimmy Hall were given carte blanche to cover the event from sound check to encore, stopping briefly for a sit down chat with Mr. Foxx piano side. Shoots like Jamie Foxx for BET come from our friends at Crew Connection that continually offer us great opportunities to “Make Cool TV” with them. Since 2003 Crew Connection’s staff has worked hand in hand with GTT’s with some of the highest end clients . We really appreciate and value this relationship and Jamie Foxx is just another glowing example. Thank you Crew Connection. We look forward to the next shoot. Tom and Jimmy Loved this one! Tom had the best seat in the house mirroring Jamie during the big curtain unveil, welcomed by screaming fans. The show was mostly music with random injections of comedy and impersonations(Ray Charles, President Obama). The guys lensed the special with Go To Team’s Sony CineAlta F900.